Beer There, Drunk That blog discusses this most noble drink produced through natural processes with such wonderful, simple ingredients, and the important role it plays, or should play, in people's everyday lives. In a world where it's normally frowned upon to reach for a beer before midday (except at airports, you might have noticed) the so-called "breakfast stout", which also ironically never tends to be particularly low in alcohol, has to be one of the naughtier styles out there. Feeling naughty, I grabbed a can of this Pommie-Kiwi collab brew and decided to dive in. The first thing I noticed before anything else wasn't the design on the can, but the size of it. At 440ml it bucks the trend of small-batch indulgences being presented in smaller measures, which is just as well, because if it's going to replace my morning coffee then there needs to be enough to fill a mug. As for the picture on the front of the can that shows a golden, jam-bedrizzled waffle, it certainly raised my expectations but not nearly as much as the amount of saliva in my mouth. The smooth, jet-black liquid that gushed into my glass produced, quite possibly, the most perfect head I've ever seen: soft, fluffy and compact, it could almost be a marshmallow bobbing about on top. With such promising appearances come the hopes of an aroma to match, and I'm pleased to say that it delivered on the goodies. Rich, indulgent doughy aromas topped with hints of sweet but slightly tangy berries sprinkled with spicy cinnamon wafted up from the glass, and at this point if the flavour was anything but totally luscious it would have led to complete devastation. Why do I only have one can of this? is the first thing that sprang to mind after taking a lengthy swig. WOW. A punchy, fruity drizzle of blueberries and blackberries cut through the grainy, dark roasted malts as they mingled and melted together on the tongue, peppered with a spicy, aromatic hint of cinnamon. In a stroke of sheer genius, this beer manages to be extremely quaffable while being rich and decadent. And best of all, unlike many other beers of the sort, there's nothing remotely synthetic or fake-tasting about it. Nope, just delicious. So much was going on as I made my way down the glass that I was oblivious to the 6.9% alcohol content that's noticeable only in the form of a gentle warmth, just like that of your breakfast waffle. I've never been much of a breakfast person, but if this is what I've been missing then sign me up to the club. 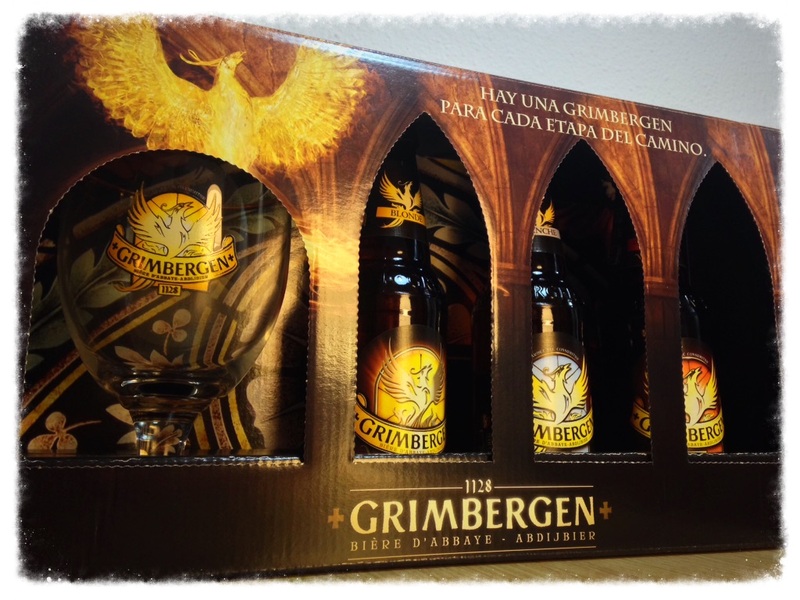 The Blonde, The Blanche and The Ambrée: The Grimbergen range. These bad boys and the chalice they were destined for came into my possession long ago when everyone in the northern hemisphere was in the throes of winter, and yet it's taken me until now to sip my way through the trio, starting with the lightest in a temperate April and ending with the darkest in the unrelenting heat of a Murcian June - perhaps not the most logical sequence as far as matching beer with season goes, although the colours did follow the same pattern as my ever toasting skin. Grimbergen beer has been going, in one way or another, since the dark Medieval days of 1128 - although since starting its life as a monk-brewed abbey beer in Belgium, the periodic accident and conflict-driven destruction of the abbey followed by several commercial takeovers in more recent times means the beer, now brewed partly in Belgium and partly in France, probably differs somewhat from what the Norbertine monks of Grimbergen used to get sozzled on with their guests. 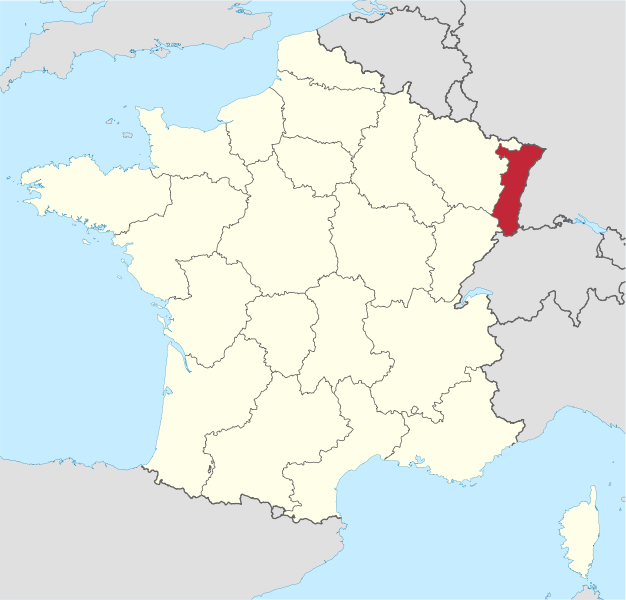 Indeed, the Belgian and French breweries even brew completely separate varieties (those coming from Belgium being mainly Blond, Dubbel and Tripel), meaning that the beers in my box were sure to have come from the Kronenbourg brewery in Obernai, France. Just call me the Beer Detective. But no beer is complete without a story, and as the monks' use of the phoenix would imply, rebirth is a significant aspect of this beer's identity - so if the legend at the very least has managed to be kept alive over the course of almost a whopping nine centuries, then all the better. 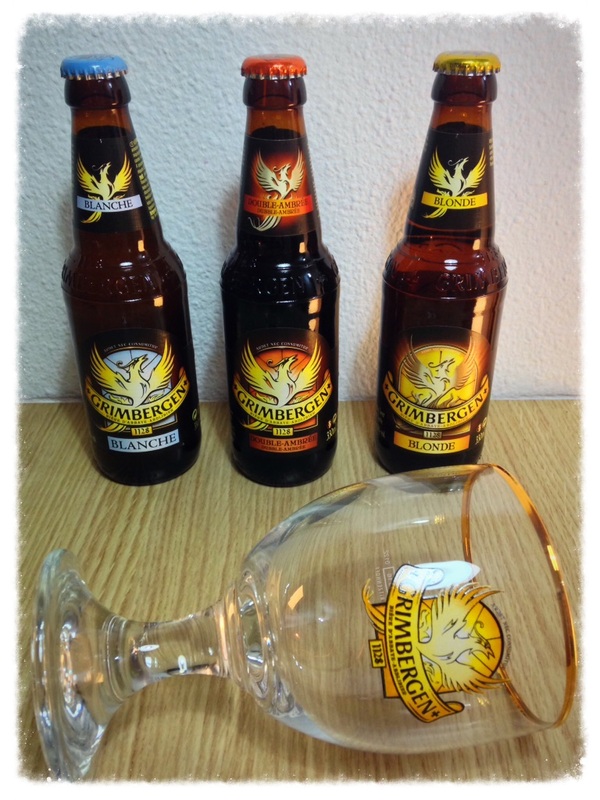 She pours a perfect golden amber with a dense, bright fluffy head and, as with all of Grimbergen's beers, looks particularly fine in the beer's own purpose-made chalice. It had been a long time since I'd tasted the delights of a Belgian-style ale and the distinctly Belgian whiff of spicy clove that wafted up from my chalice's bowl was a stark reminder of where this brew was born. Along with these spicy notes there were plenty of hints of toffee and caramel malt on the nose giving me a clue as to what was to come. After a gulp or two, malty depth came through peppered with spicy clove, broken up ever so slightly by a hint of bitter citrus, followed by a floral, soapy aftertaste. For its high ABV it goes down nice and easily, and since it's got plenty of depth you can afford to sup on it chilled without fear of compromising on flavour. The Blanche pours an opaque pale straw colour with a small head that fizzled out quicker than I could snap it. There's plenty going on on the nose with fragrant, perfumey and floral aromas seasoned with herbal notes and spicy clove, overall making for a fresh and complex first impression. The fresh flavours of zesty citrus fruits and a strong presence of coriander and clove come through after a sip, but it soon becomes clear that where it exceeds in flavour it lacks in body and depth, almost a diluted version of what it could be. Rather than a sipper to savour I'd call this an introduction to the style to be knocked back. The darkest of the three, this pours a dark mahogany with a thin beige head. I picked up the aromas of dark stone fruits and berries, even if they were a bit hesitant in coming forward. The flavour doesn't disappoint, with rich, fruity woodland berries backed by sweet caramel, a hint of treacle and a dash of bitter coffee - a sweet, fruity experience with the welcome addition of an added 6.5% alcoholic warmth. As the aroma hadn't been so forthcoming I was pleasantly surprised by the taste. A touch more body could have brought more depth to the flavours, but overall of the three in the set, the double-ambrée is the brew I'm fondest of. Santé! I might have something approaching an oversupply of beers from my new Spanish region of Galicia developing, but since Christmas I've had something different put aside for a special occasion. That something different was a unique English ale by Batemans Brewery that my girlfriend had bestowed on me, and that special occasion was Friday. 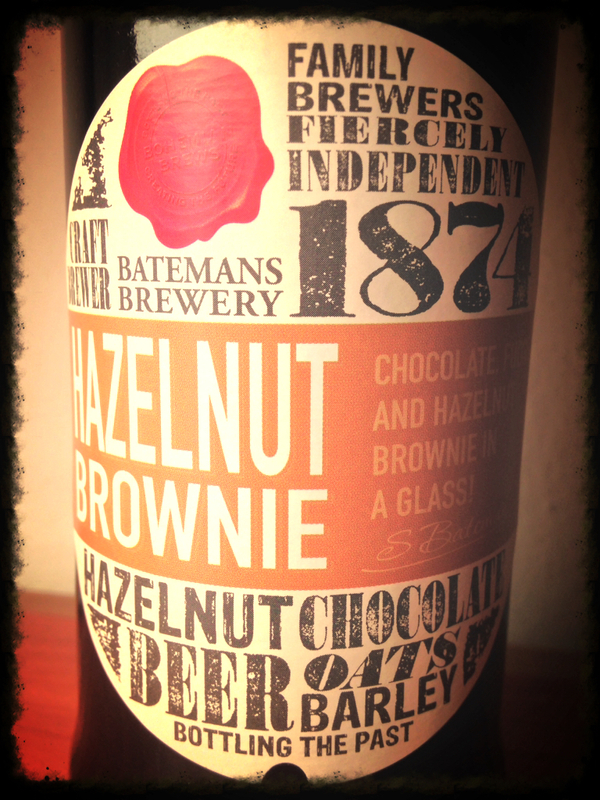 The label on Hazelnut Brownie, as with the other beers in Batemans' Sovereign range, has undergone a bit of a rebranding with a contemporary typographic look in favour of the more homely, rustic appearance that it used to sport on its beer pumps. Batemans is keen to highlight its long heritage, though, with its big wax stamp and the year it was founded, 1874, proudly displayed on the front. No sooner is the cap cracked off than the beer's lusciously fragrant aroma starts permeating the space around you without even needing to edge your nose closer to it. I shoved my nose down the bottle neck for a bigger hit anyway, sending my brain into a chocolatey frenzy before the stuff had even left the bottle. Once it had been given a swill around my glass, rich, creamy aromas of chocolate and sweet malts were diffusing apace. It was clear at this point that this would be no subtle interpretation of a hazelnut brownie. It pours a gorgeous dark mahogany, with a generous coffee-coloured head that gathers and dissipates cleanly. If you've noticed that this is the only blog post of mine where that hasn't been captured in a photo then you'd be right: my chocolate-scrambled brain forced me to dive in straight away before I could. Soon after doing so my cakehole was filled with the most ridiculously uncanny resemblance to a brownie I'd ever sampled from a beer glass. Sweet chocolate was there in abundance along with a touch of cinnamon spice and a distinct hazelnut finish that was too good to believe it could be true until I went back for more. While it wouldn't hurt for the body to be a bit fuller, it's certainly as rich and decadent in flavour as it could be and manages to impart a creaminess, I assume from the use of lactose, that could have you believe you'd had it served up with custard, warmed up by the 6.3% ABV. 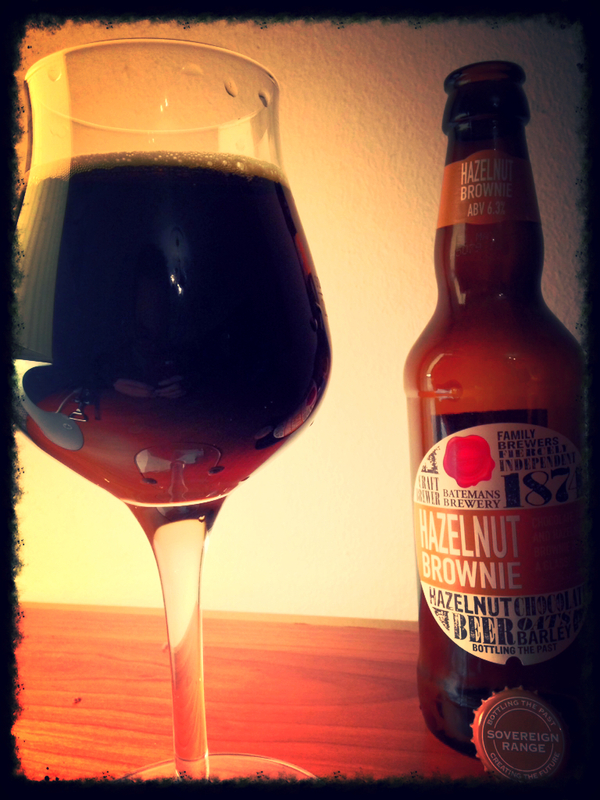 Quirky, dessert inspired beers are nothing new, but what sets Hazelnut Brownie apart from so many others I've tried is that you don't need to use your imagination to convert those dark roasted malts and reinterpret them as chocolate; this one does all the work for you. Whether this sensation has been achieved solely with the creative use of malt, hops, chocolate and cinnamon I can't say for sure, but who cares? It tastes like what you wanted it to when you picked it up off the shop shelf. When I suggested to my German colleagues that my girlfriend and I might be popping over to Düsseldorf for a spontaneous long weekend, it didn't take long for the topic to turn to beer. I'd been to Berlin not too long before and I had to break it to the Berliners among them that I wasn't impressed with their local brew Berliner Kindl. Seeking their validation that Düsseldorf was a good choice over Frankfurt and other destinations in the same price range, the general consensus was yes. 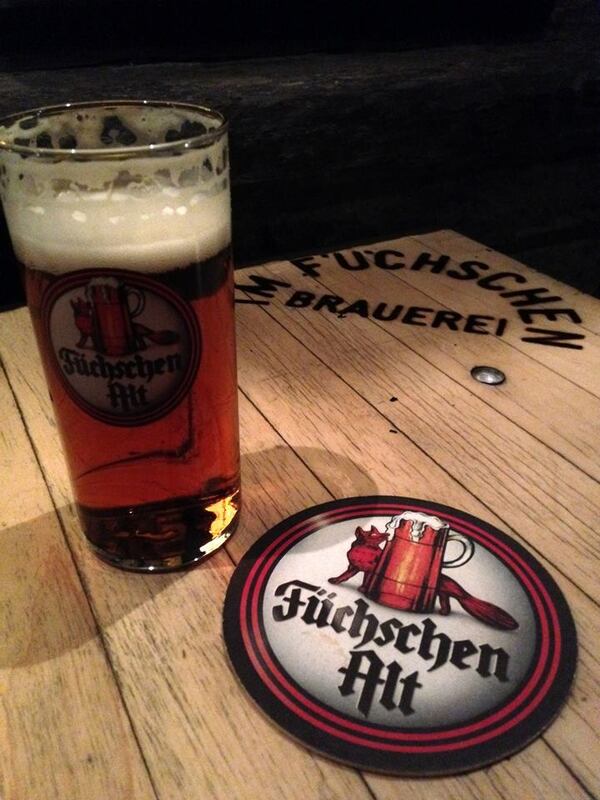 "And they drink Altbier there", one of the Berliners added eagerly. The prospect of escaping the daily grind for a few days was exciting as it was, but the idea of trying not just a new range of beers but a new beer style altogether suddenly added to the appeal immensely. 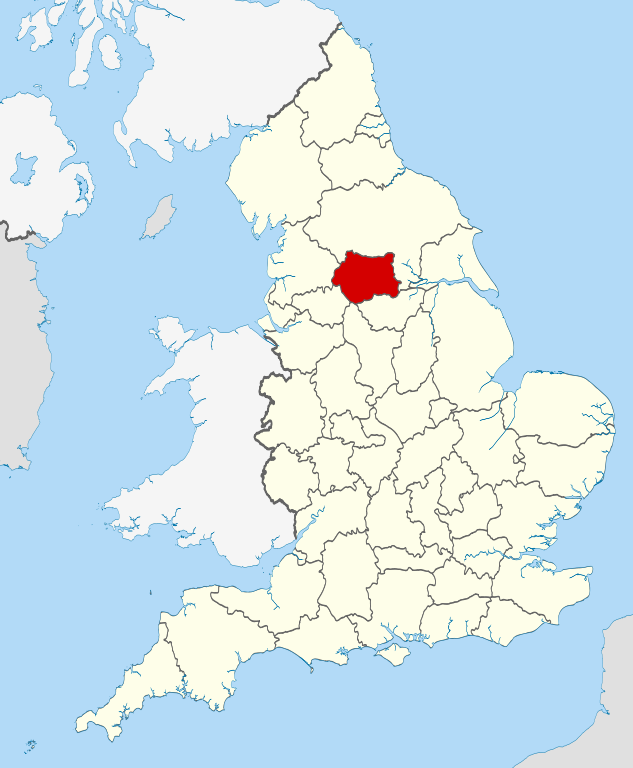 So when I picked up a tourist map at the hotel I was staying at and noticed that "Brewery-Inns" featured as a distinct category alongside museums, shopping and monuments, and that most of them were within comfortable stumbling distance of the hotel, things got very interesting. 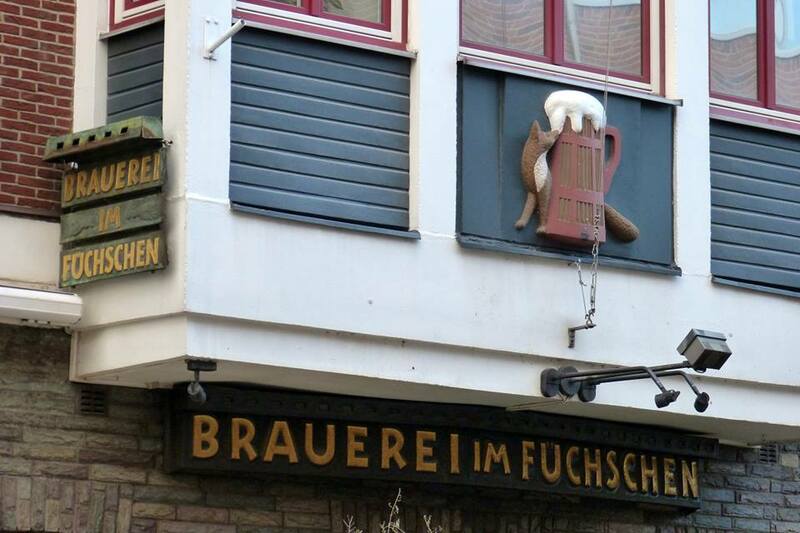 A short 7-minute walk towards the town centre brought me to the closest of the five brewpubs, Im Füchschen. I was impressed to see that at around midday the pub was full inside and out with happy Germans sitting and eating pork knuckles on a bench or spilling out onto the pavements to stand beside a Stehtisch despite the temperature hovering between 10 and 12 degrees, practically every one of them holding short cylindrical glasses of a dark copper-coloured beer. This scene piqued my curiosity as it defied everything I thought I knew about German beer culture, my mental image of it involving mainly curvaceous half-litre wheat beer glasses or imposing litre-large dimpled tankards holding something light and golden inside. Tempting as it was to dive in right away, I made a mental note to stop by on the way back instead. 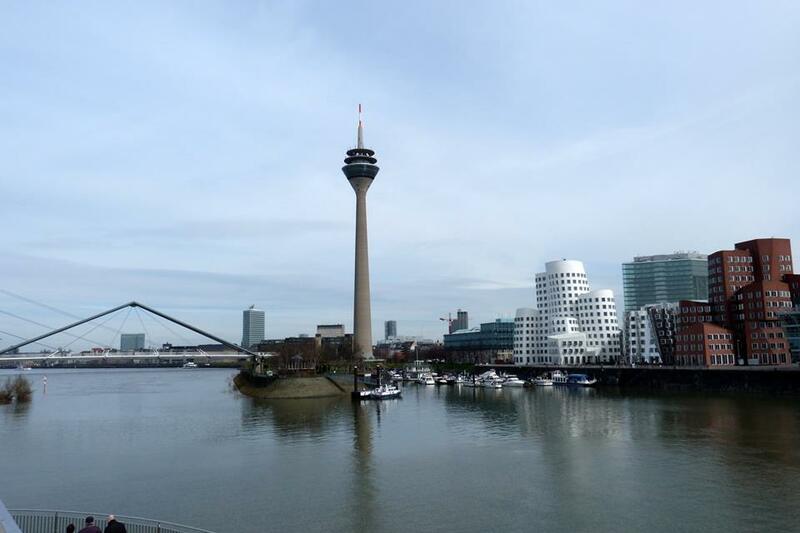 As we meandered through Düsseldorf's streets it became clear that the scene at Im Füchschen was no exception. These little half-pint glasses of Altbier were everywhere, not just at pubs but accompanying people consuming sausages and chips or even ice cream outside on terraces. Having been on the go since 5am I put my desperate need for a coffee on hold and decided to join in. 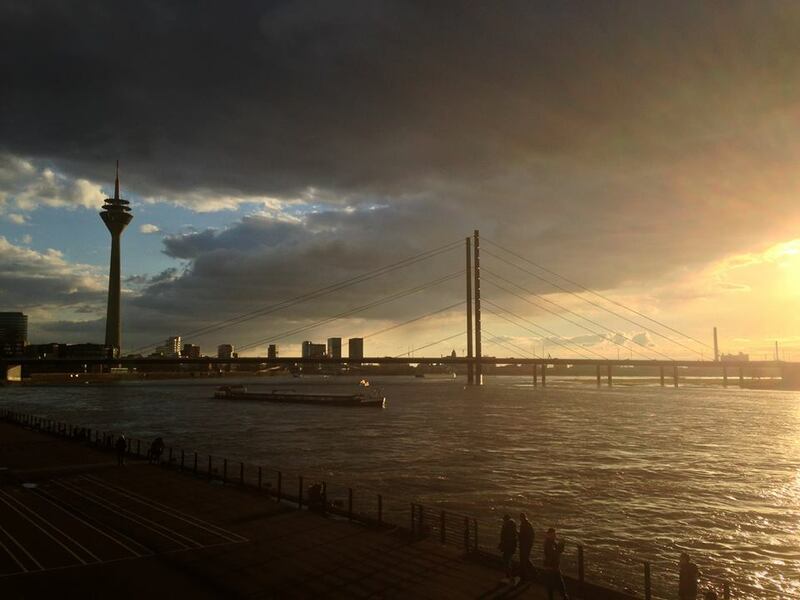 With a cardboard plate of Currywurst and chips we sat outside at a table near the riverbank among the Düsseldorfers enjoying the fresh air under the warming glow of an outdoor heater. ...There's a good reason for this: Altbier, (or "old beer") is so named not because it's the manky stale leftovers found lurking at the back of the cellar, but because of the fermentation method used. 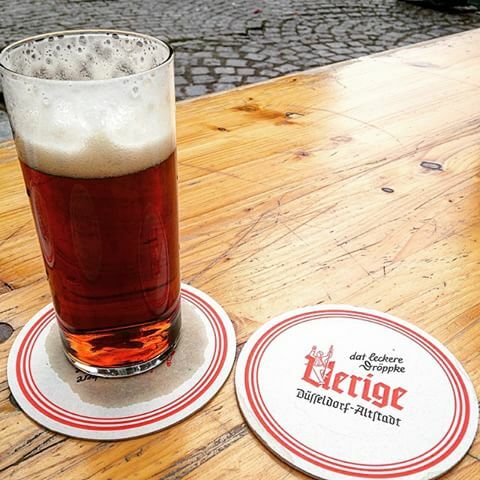 Rather than being bottom-fermented like most continental-style lagers, Altbier is top-fermented in the same way as British ale, a process that dates back much further. Not that the two words are linguistically linked in any way, but knock off the "t" from Alt and add an "e", and that's practically what you have in an Altbier. It's no surprise that my concept of German beer culture had mainly revolved around huge glasses of foaming pilsner style beer being clunked together by people wearing Lederhosen and Dirndls in an enormous tent; when most people think of German beer they think of the scenes at Oktoberfest and all that's on offer there. The truth is, though, that this represents the beer culture specific to the state of Bavaria, and it's one that hasn't just affected the way German beer culture is perceived generally, but even the very beer styles on offer in the rest of the country. When the German states unified to form a single nation in 1871, Bavaria wasn't going to play along unless the rest of Germany adopted the beloved Reinheitsgebot, the so-called "purity law" that allowed only three main ingredients, water, malt and hops (somehow omitting yeast at the time) in the brewing process. This suited Bavaria where the tipple of choice was a refreshing golden lager, but put limits on what the rest of the country could brew, and eventually the golden bottom-fermented stuff was the dominant style. 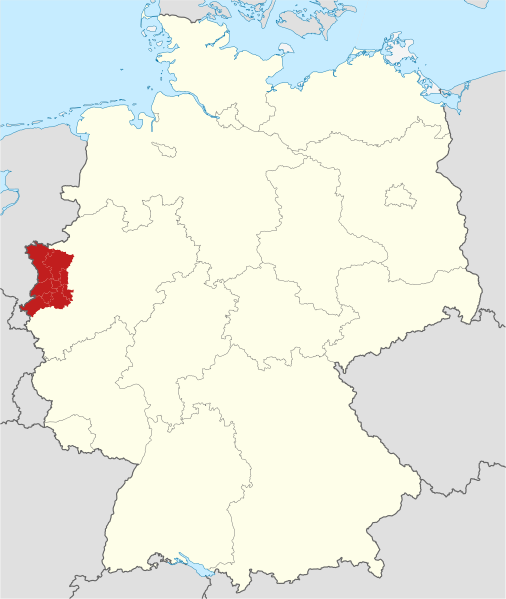 That's not to say that a few local beer styles didn't survive, and Altbier was one of them, remarkably isolated to the lower Rhine region in which Düsseldorf nestles. After a day of burning the candles at both ends it was time to put them out at Im Füchschen on the way back to the hotel. We took our places on a bench outside the front of the brewpub and soon after, a worn-out looking waiter holding a tray full of pre-filled glasses laid down two Füchschen coasters and plonked zwei Alt on top of them. Asking us for €3,80, we gave him €4 and he thanked us (claiming the change as his each time). For the rest of the evening we barely had to signal anything more than a quantity and sure enough, two Alt would land beside us. Everyone bypassed the other drinks options on the menu for Füchschen Alt, everyone tipped on every drink, and everyone was merry. The atmosphere was no less convivial in the Old Town the following day at Zum Uerige, where the brewpub has resorted to claiming two sides of the street as theirs to provide enough seating space for all their eager punters who, once again, I was astonished to see were all drinking exactly the same brown ale, 4.7% with a biscuit malt base and a clean, hoppy finish. 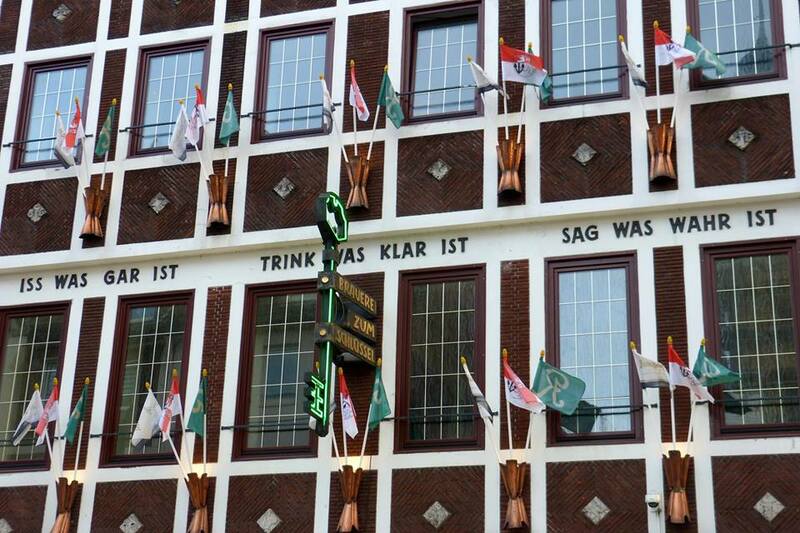 Uerige is so Düsseldorf that even the menu is in the local dialect, along with their slogan Dat Lekkere Dröppke (Das lekkere Tröpfchen) - the lovely drop - and lovely it was. We didn't manage to visit all the brewpubs (what better reason to go back?) 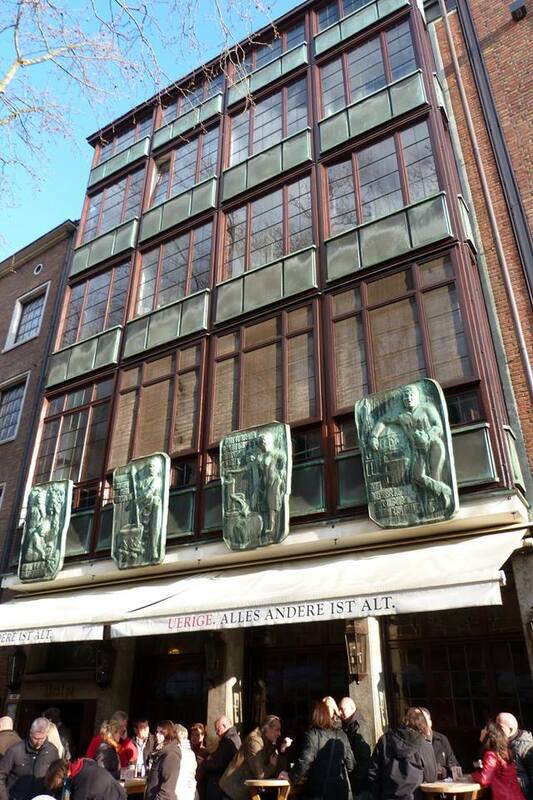 but a few others to look out for are Zum Schlüssel (see below), Kürzer and Schumacher. Schlüssel Original went down smoothly with sweet crystal and chocolate malts and a hint of woodland berries. 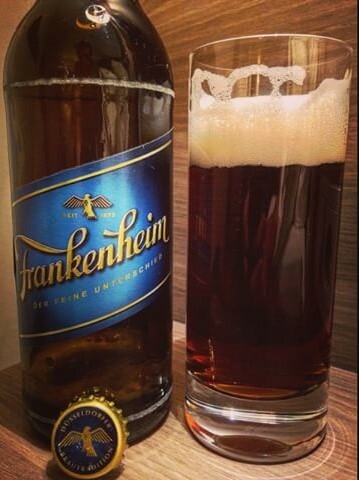 Frankenheim had bitter, earthy and peppery hop notes and slightly smoky caramel malt flavours with a hint of nuttiness. 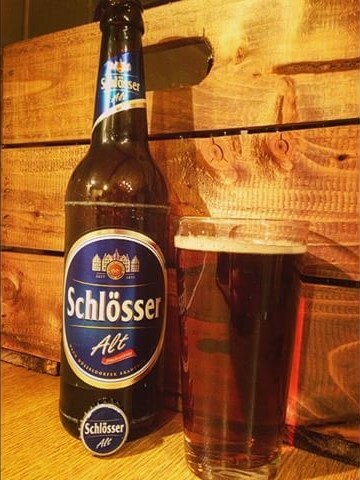 Schlösser Alt was earthy with hints of crystal and chocolate malts along with a nuttiness and hints of candied fruit. This one came home with me, hence the sacrilegious use of a shaker glass. 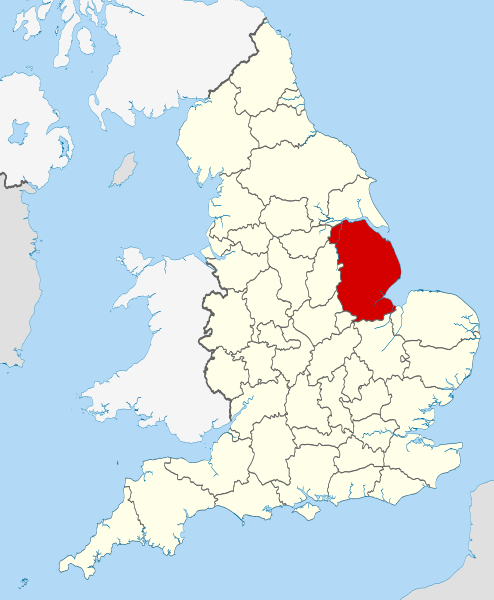 This was an eye-opening experience for this beer-swilling Brit. Not only had I got up close and personal with a new beer style, but experiencing this kind of widespread yet highly localised uniformity of traditional ale-drinking was downright bizarre. Not that it's unusual in parts of the continent to walk into a bar and see everyone drinking the same thing, but if you do it's normally a golden-coloured macro-brew that's probably also available next door, and behind many other doors. These are both very different pictures from back in the UK where anywhere you can find ale, whether it's a traditional pub or a new micro-brewery, you'll find a range that's desperate to cater to everyone's tastes while reflecting participation in the New World inspired craft beer movement. 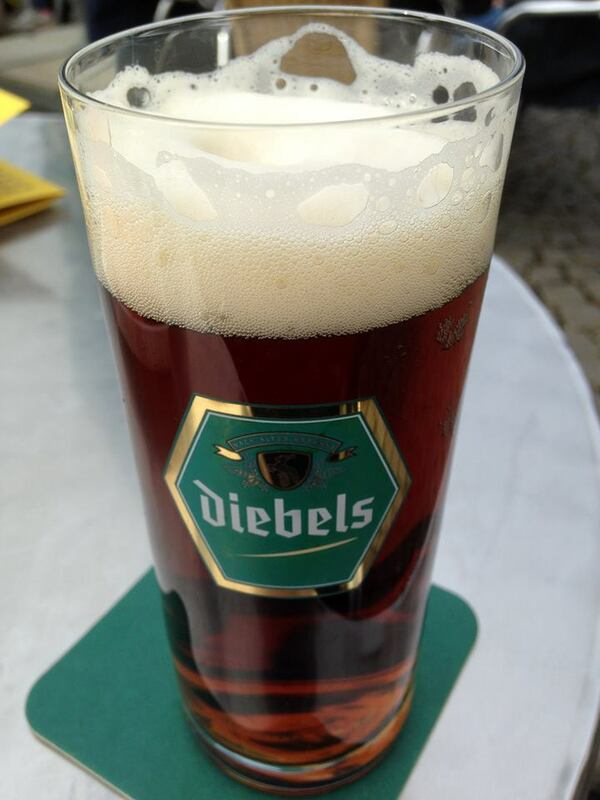 Where Brits and other participants in the craft beer revolution are rebelling against a time when they were wooed by poor, mass-market lagers, however, the tradition of Altbier, be it small scale or large scale, never fell out of favour with Düsseldorfers in the first place. That's not to say there aren't plenty of bars where you can neck refreshing bottles of Pisse, but the Old Town brewpubs and their humble produce have continued to flourish regardless and, with nothing to rebel against (apart from possible future acquisitions), Düsseldorfers continue to embrace this beer style en masse. Who can blame them?